Weed Whacker Scratch Card Review - Casino Answers! 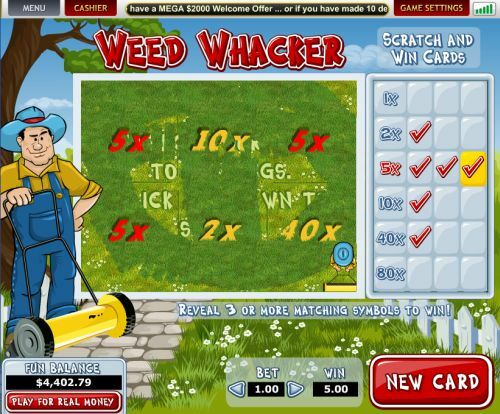 Weed Whacker is an instant win online scratch card developed by Top Game. You can play the Weed Whacker scratch card game at Bovada. The Weed Whacker casino game is a nickel scratch card ticket. You can bet $0.05, $0.10, $0.25, $0.50, $1, $3, $5, $7 and $10 per ticket on the Weed Whacker instant win scratch lottery game. Weed Whacker has a decent betting range for most online scratch card players. To play Weed Whacker, select your bet and press the “New Card” button. Then you can either scratch the ticket manually or press the “Reveal” button to automatically scratch the entire ticket (or mow the entire lawn). The highest prize value on the Weed Whacker scratchie is 80X. You can win 80X your bet by matching three 80X symbols on the Weed Whacker scratch ticket. To have fun and win on the Weed Whacker scratch card, play it now at Bovada! There are 6 winning combinations on the Weed Whacker scratch card. The complete payout schedule is as follows: 1X, 2X, 5X, 10X, 40X and 80X. By betting $10 on a game of the Weed Whacker scratch lottery ticket, you can win up to $800! Weed Whacker is currently the only scratch card game being offered at Top Game casinos. If its quality is any indication of future scratch card games from Top Game, We look forward to seeing more. You can play the Weed Whacker scratch & win game at Bovada. Can American players play the Weed Whacker scratch card for real money? Yes, USA players are welcome to play the Weed Whacker internet scratch card game at Top Game online casinos such as Bovada. Is there a Weed Whacker flash game available that I can play for free? Unfortunately, there is no flash game available for the Weed Whacker scratch card. For scratch card flash games that are USA-friendly, please visit Bovada.